To meet the modern consumer's demands for energy efficiency and stylish design, today's sliding glass door manufacturers are stepping up to the plate with better materials, new technology and superior designs. If you need to replace your sliding doors, consider the many options available to you before you make your purchase. Aluminum: The new aluminum sliding doors are much different than the older models. Today high-quality aluminum doors offer durability, safety, style and energy-efficiency. Wood: Wood sliding doors present beauty, style and warmth. Because wood is susceptible to the effects of sun and moisture, wooden doors must be given a durable exterior finish to prevent warping and unnecessary damage. Most manufacturers prime or even paint wood doors in standard colors before the doors leaves the factory. Remember that upkeep will be important; sand, scrape and repaint the doors as needed to maintain their finish. Vinyl Clad: This is typically a wood sliding door with a vinyl cladding around it. 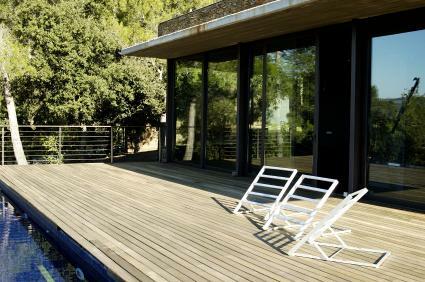 These sliding doors offer outdoor protection for the wood. The color is formulated right in the vinyl so you never have to paint the door. Some manufacturers offer a vinyl cladding only on the outside to offer the esthetically pleasing look of wood on the interior. Fiberglass: Sliding doors made from a durable fiberglass composite resist whatever Mother Nature has to offer. Composite doors can be made to look exactly like wood, but will not crack or warp. Voids in a composite door are filled with a foam insulation, too, giving a good insulation R-value. Foam-Core: Foam core sliding doors come with either an aluminum or vinyl clad shell filled with polyurethane foam, offering 5-6 times the energy-efficiency of a wood sliding glass door. Look for glazed glass to have an energy-efficient sliding glass door. High performance glaze means the door is truly energy-efficient. Fortunately, this comes standard on most high quality sliding doors. Typically most sliding doors have double paned glass with low-emissivity (low-e) coating. Most manufacturers let you specify which type of glazing you want on your sliding door. They also offer the option of having your double paned glass filled at the factory with argon gas. You shouldn't have to worry about the argon gas failing if you decide to go this route; argon is heavier than air. Most, if not all, window manufacturers use a flooding system that floods the area with gas, then seals the frame tight. The standard height for a sliding door is 6-feet, 8-inches. Standard sliders only have two panels; one stationary and one that opens. Manufacturers have realized different people want different things; a sliding door added when making kitchen renovations will differ from a door leading to a pool deck from the master bedroom. Sliding doors are now available in 6-feet, 11-inches or as tall as 8-feet. Doors can have four panels or more and can span about 16-feet wide. Many homes require custom size sliding patio doors because the standard sizes don't work with the design of the home. Look for manufacturers who are happy to work with you to design doors that are suitable for your needs. Most sliding doors have a screen on the outside of the glass that rolls on a track like the sliding door. If this track gets some debris in it, it will cause the screen to stick; keep this track clean to help the door function properly. Some manufacturers offer top mounted screens like rolling screens; the debris doesn't effect the operation of this type of screen. When you visit these manufacturers, check out the many options for sliding doors that are more than just the traditional glass patio doors most people are accustomed to. Other options include interior doors and room dividers that will give your home a classy, modern look. If traditional sliders were never that appealing to you, take a look at some of the new designs. You might be pleasantly surprised by what you find.